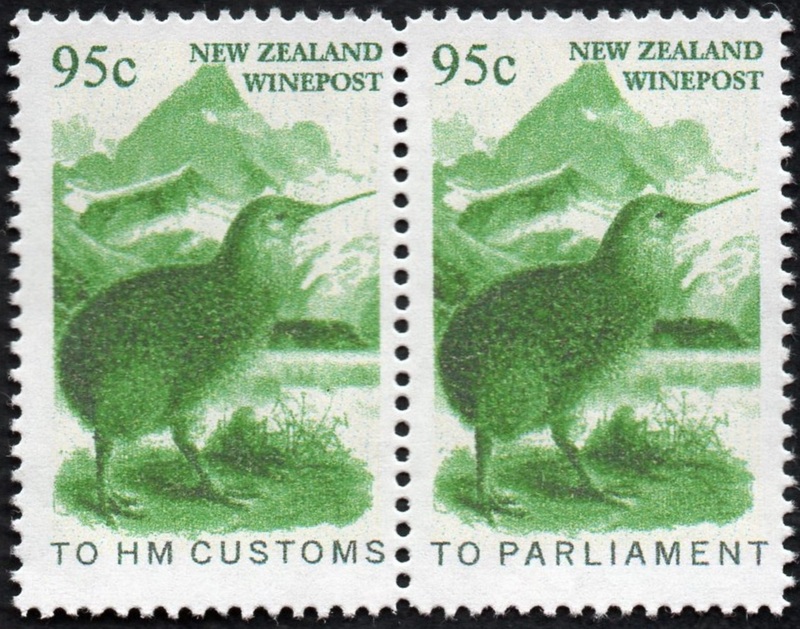 Virtual New Zealand Stamps: New Zealand Wine Post - Officials. New Zealand Wine Post - Officials. 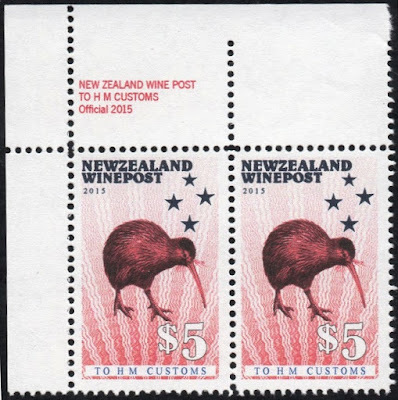 When Mary finished her three large pages of stamps from the local postal agency New Zealand Wine Post there was some tidy up work needed to be done so the collection would be a lot easier to navigate around. I began putting in these links and added that small Index at the top of each page. Now I am listing each issue in our main Index pages too. Mary said that it might be of interest doing a thematic collection on the official stamps used for communication with the New Zealand Government. Since I also do many of the thematic collections for this blog I agreed to do this one as well. My intention here is to display these six stamps and four trials together so they can be enjoyed and compared. Most of the information found here has come from Mary's pages. 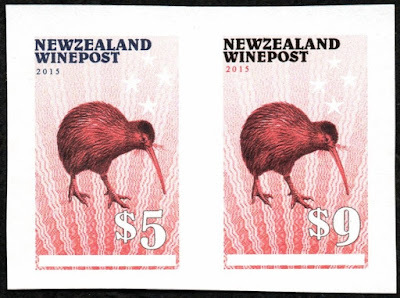 New Zealand Wine Post (Stampmetro). Summary - New Zealand Wine Post Overview. Page One - New Zealand Wine Post 1990 - 1999. Page Two - New Zealand Wine Post 2000 - 2009. Page Three - New Zealand Wine Post 2010 - Today. 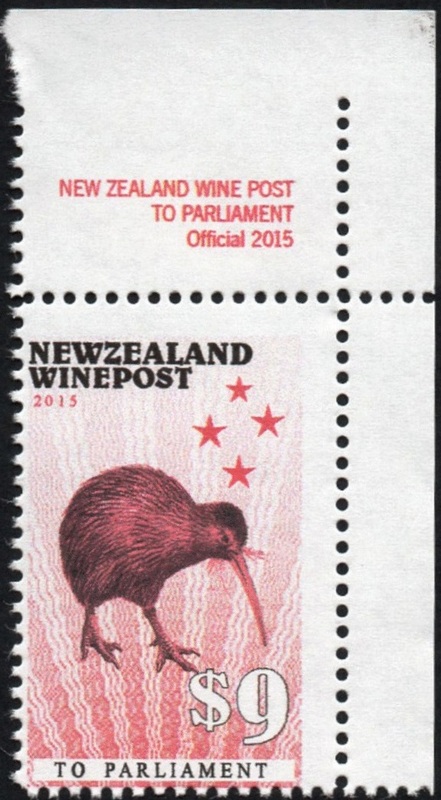 Special Page - New Zealand Wine Post - Official Stamps. Special Page - New Zealand Wine Post - Wine Labels. Why were these 'Official Stamps' required? During the early 90s, very important legal documents were sent to members of Parliament determining the future of the winery. The questions in those documents were asked in the House and the Official answers posted to the winery with Parliament Official Mail. To secure the safety of the documents posted from the winery it was deemed necessary to overprint current stamps and use them for use as hand delivery of priority, which also being addressed to Parliament, were processed quicker. 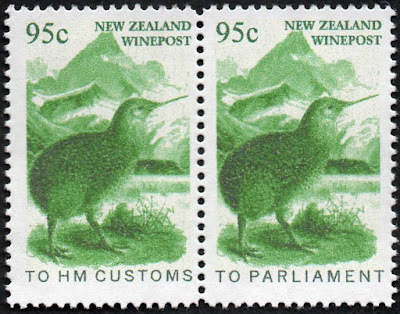 In a similar way, legal letters to New Zealand Customs concerning shipping and importing of wine and payment of tax on wine produced had their own stamps too. They carried their own official overprint and given a priority. Letters addressed to these locations still carry their special stamps with other designs being produced regularly. 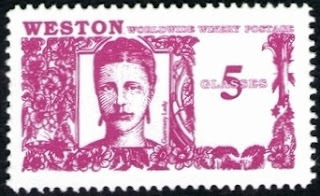 1993 Officials - Guernsey Lady. New Zealand Wine Post 1990 - 1999. Date of Issue - 5th Jan 1993. 1994 Official - 5 glasses To Parliament. 1994 Official - 5 glasses to HM Customs. 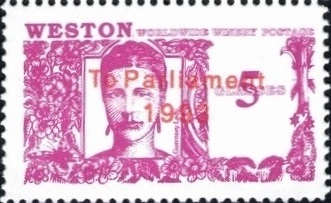 Sheets of the Guernsey Lady were overprinted for official use. A blue overprint was used for the H.M. Customs overprint and a red overprint for the To Parliament Overprint. The top row of four was overprinted To H.M. Customs: The bottom row of four was overprinted To Parliament. The idea of using overprinted stamps was rejected for all future Official issues because of the overprints, particularly the red Parliament, proved very hard to read. 1976 Primitive Wine Label. 1991 The Guernsey Lady. 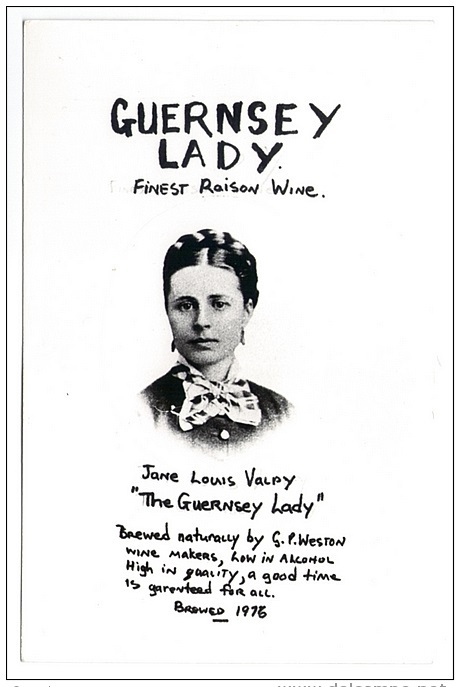 The Guernsey Lady has a long history with Weston's Winery / New Zealand Wine Post as it goes right back to the very first hand drawn label of 1976. Of course, the original design of 1991 must also be mentioned here as well. 2004 Officials - Green Kiwi. New Zealand Wine Post 2000 - 2009. Date of Issue - 18th Aug 2004. 2004 Official - 95c To HM Customs. 2004 Official - To Parliament. 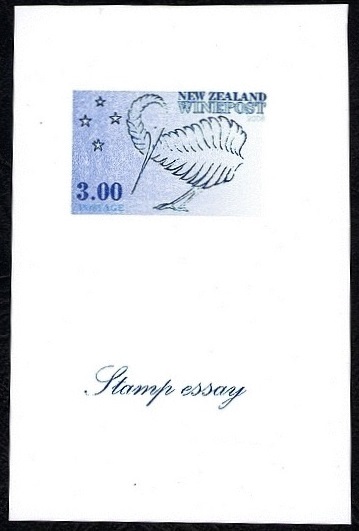 In 2004 the second issue of Official stamps was released featuring a kiwi against a pictorial background. Due to problems reading the overprints of the 1994 issue it was decided to produce a completely new design including space for the text overprints as part of the design. This led to a stamp that was easy to read and had a pleasing appearance. Joined pair showing both officials. 2008 A Possible Official Design. This rather clever design shows a fern bent to form the outline of a kiwi. The four stars of the Southern Cross are shown on the left-hand side. The three most famous New Zealand icons in one design. Well done! It's a pity it was never used. 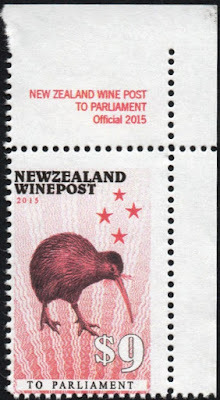 Now while it has not been stated by NZ Wine Post that this was it be a design for an Official Stamp I believe that it is very likely the case. 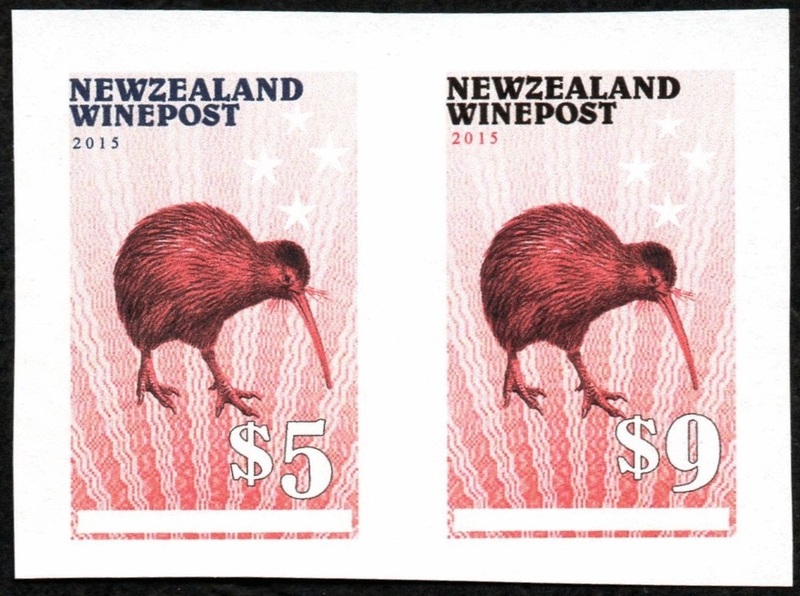 NZ WinePost say that this design is still under consideration and could appear in a future general issue. New Zealand Wine Post 2010 - Today. By 2013 it was time for the 2004 Officials to be replaced with a new design. At first in 2013 a design was created featuring a kiwi in blue, but this was rejected and never issued. 2013 New Zealand Wine Post imperforate trial. In 2014 a new design was trialled using a map of New Zealand and the four stars of the Southern Cross against an interesting violet background. Trial proofs for new Officials on ungummed paper, imperforate. This design has was neither accepted or rejected. The problem seems to be with the words being printed over the background design. It is very rare to see a yet unapproved printing before the issue is printed and released. 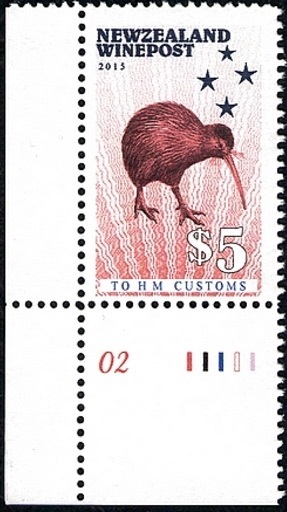 In 2015 this design was passed over in favour of the Red Kiwi design being used instead but that does not rule out this design being used at some future point. 2014 Trial Official - $5 Local. 2014 Trial Official - $9 Parliament. 2015 Officials - Red Kiwi. Date of Issue - 1st June 2015. 2015 Official - $9 To Parliament. 2015 Official - $5 To HM Customs. The final issue in this collection is the 2015 Red Kiwi Officials. The kiwi theme of 2004 was kept but the bird was placed against a rather more stylized background as was seen in the 2014 trials. I am unsure why there should be a difference in cost here, perhaps because of the importance of the Parliament mail meant the letters needed to be hand delivered. First Day Cover - Red Kiwi Officials. Notice how each stamp has its own special cancel. 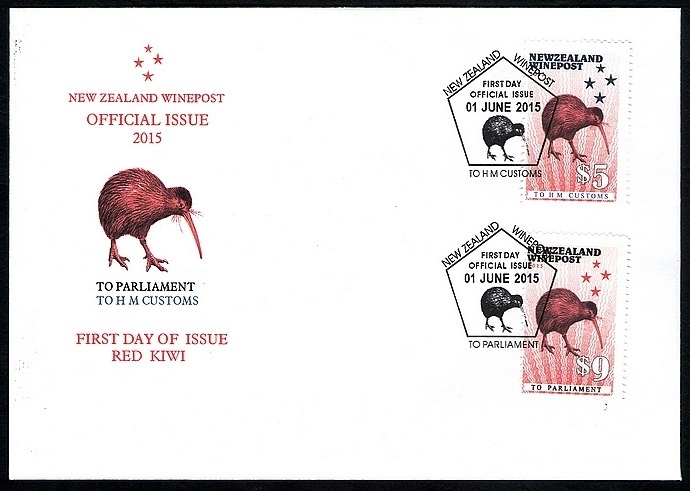 2015 Officials - Red Kiwi proofs. I good example of the proofing process where the stars have not been coloured in and the overprinted text left off too. I have been wondering about these Official stamps. It is explained that they were used for important mail to the New Zealand Government. This is interesting in that the NZ Post Officials were used from the New Zealand Government. I am surprised that there would be enough of this mail to justify a completely different stamp design. 1908 - 1910 Antarctica Expeditions. 1915 General Grant Salvage Expedition Stamps. 1970 Definitive / Pictorials - Part Five. 1970 Definitive / Pictorials - Part Four. 1970 Pictorial / Definitives - Part Three.